It's Thursday and that means there is a brand-new Inspired By Challenge to get your creative juices flowing! I'm still in "thank you" card mode, so I took this opportunity to create a thank you card using colors and details that I might not have otherwise. I really like this particular sentiment, which doesn't say thank you, but is fitting nonetheless. 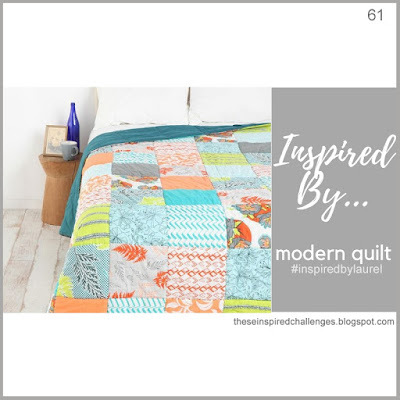 This week's inspiration piece is a modern quilt. It reminds me of the quilts that I made for two of my boys cribs. I was inspired by the colors, quilt blocks, and one block in particular...the one that is white with the orange circles. I really like how they are offset with flowers around them. To begin today's design, I die cut the Blocked Out Square Panel Confetti Cuts out of white cardstock. I layered it onto a square of Iced Aqua cardstock. 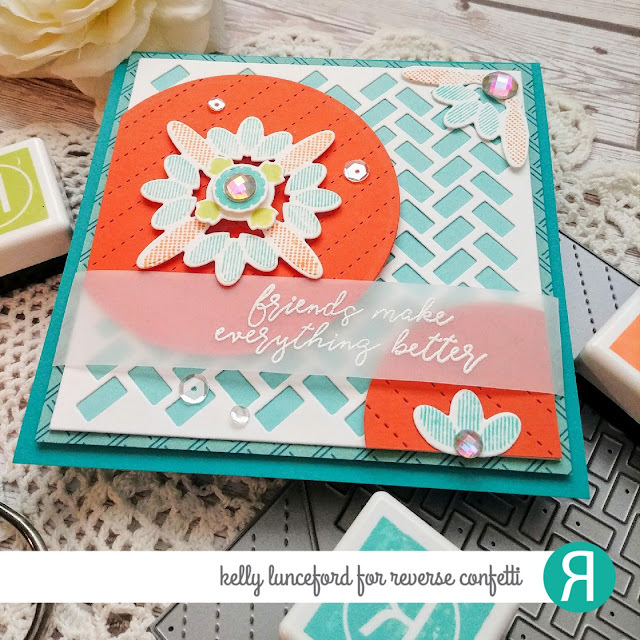 The circles are die cut out of Tangerine cardstock and then I ran them through my Cuttlebug again using the Diagonal Stitches Coverplate. Since the quilt is the inspiration, I really wanted to get some stitched details. 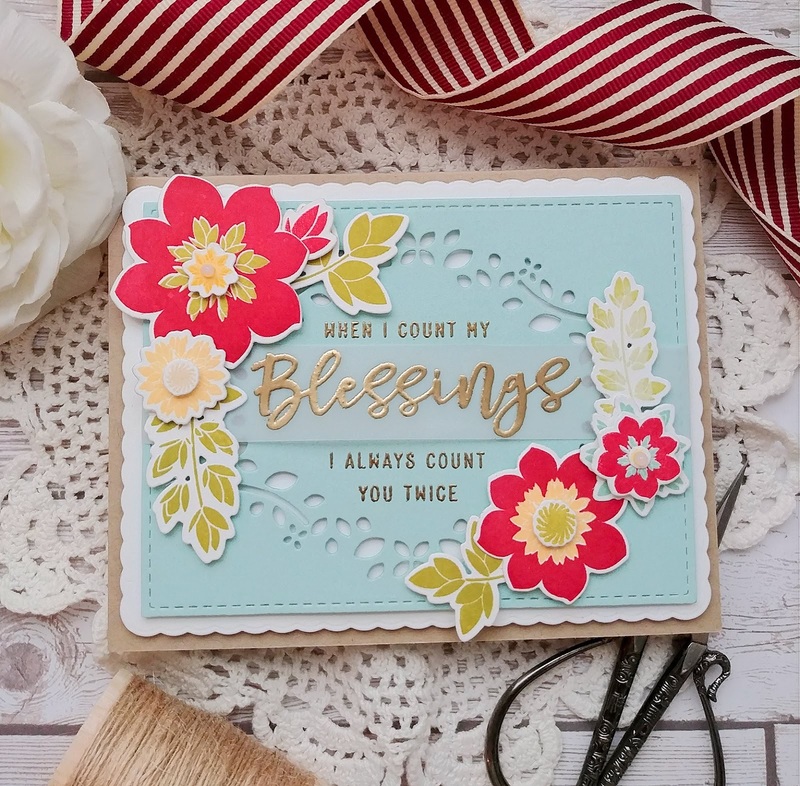 The sentiment is from the Cotton and Thistles stamp set and is one of my favorites! I heat embossed it in white onto a strip of vellum. The die cut panel is adhered to square of pattern paper from the Winter Solstice paper pad to give it an additional bit of pattern. 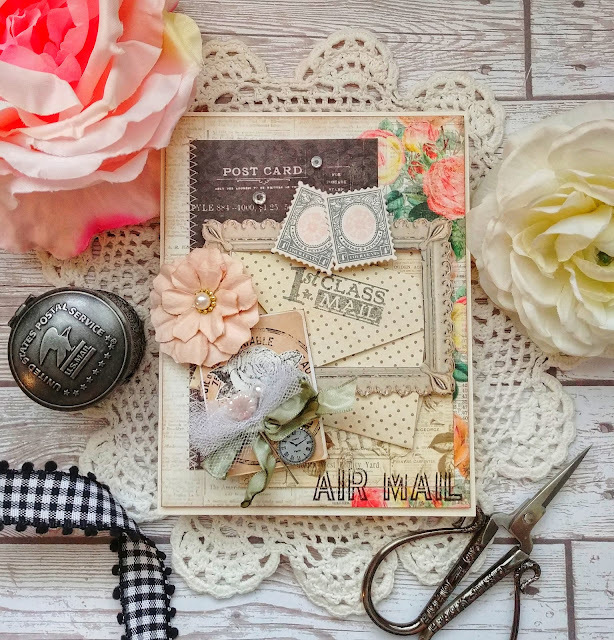 The focal images are from the Pattern Builder stamp set and are so fun to use. I haven't used this set since forever, so it was nice to get them out again! I added a few rhinestone gems as well as some sparkling clear rhinestones. I spritzed it with shimmer spray for some added shine! I hope you get a chance to join us this week! Thanks for fluttering by! Welcome friends! It's my turn for this week's Papertrey Ink Transformation Tuesday post! This is always such a fun opportunity to tweak an old design to create something new. The card that I chose to "transform" is clear back from August of 2018. 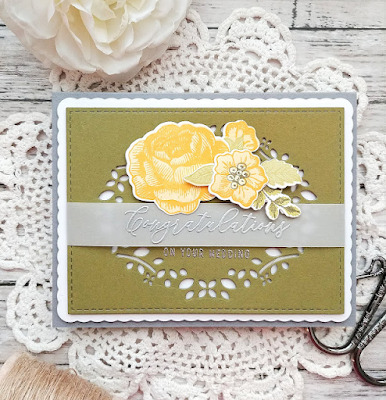 I really like the way that card turned out, but thought it would be fun to change up the colors and floral stamps to create something a little bit more vibrant and cheery! If you'd like to read the post with that particular card, you can check it out HERE. It is the second card down in the post. Here is my original card, and while I like it, especially for a wedding design, I wanted to create fuller and more vibrant floral clusters as well as change out the sentiment. I'm going to be needing quite a few thank you cards so I thought it would be fun to use a few more of the sentiments included in the Frame It Out: Many Blessings stamp set. I love how versatile everything in this set is. I was able to create this particular verse using a combination of 4 of the included sentiments. While it is perfect for Autumn and Thanksgiving, it can be used all year long depending on how you pair everything together. 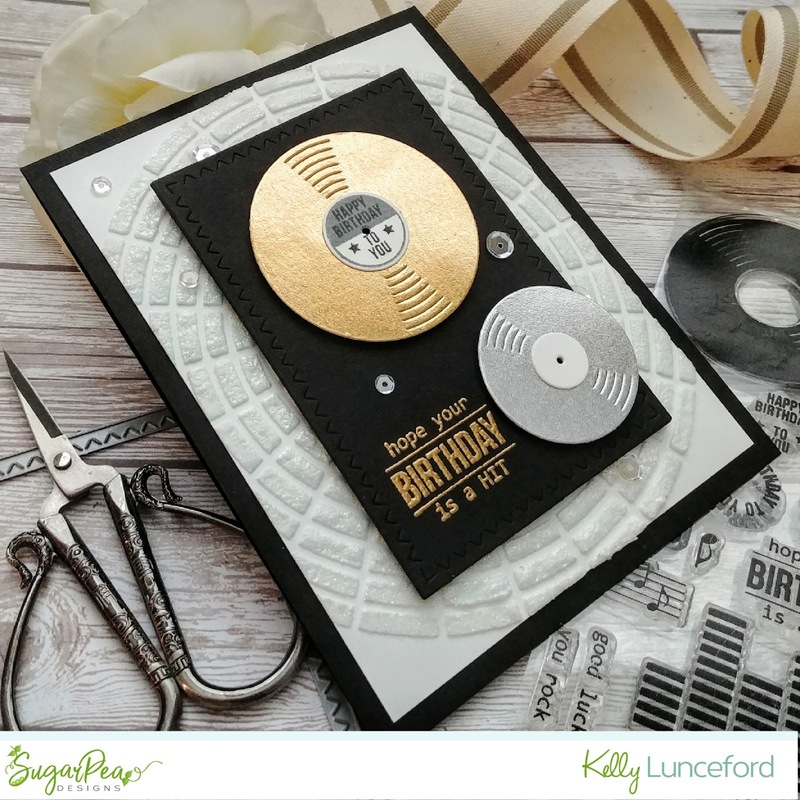 I used gold embossing powder, rather than silver, for this card to really keep it warm and friendly. I heat embossed the "blessings" sentiment directly onto a strip of vellum and then wrapped it around the die cut panel. 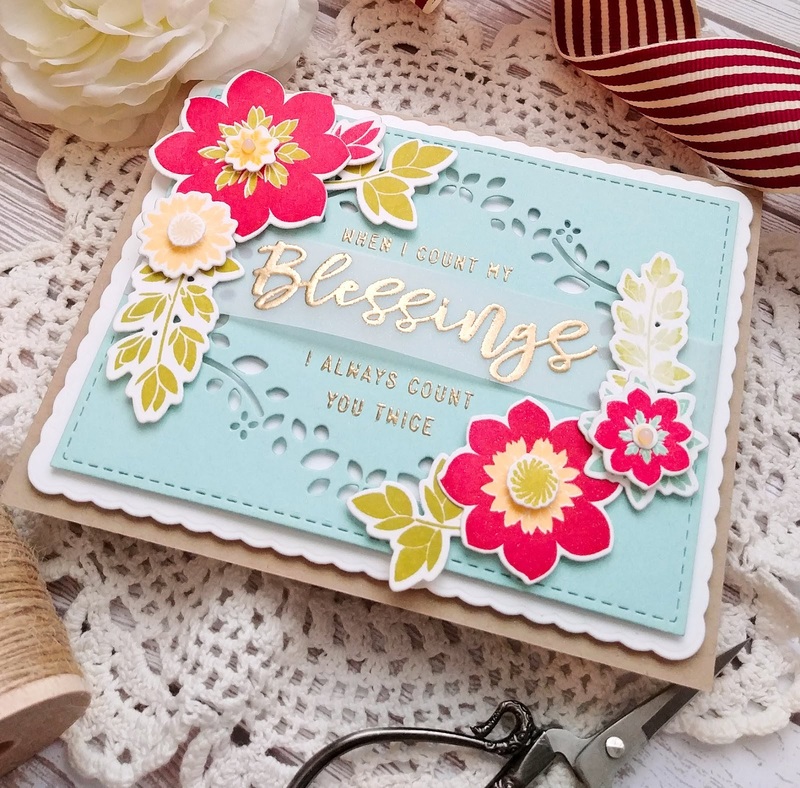 The panel was created by first die cutting a piece of Aqua Mist cardstock using the fabulous and useful Noted: Simply Stitched A2 Vertical Die. Once that was done, I used the coordinating Frame It Out:Many Blessings Die to create the frame. 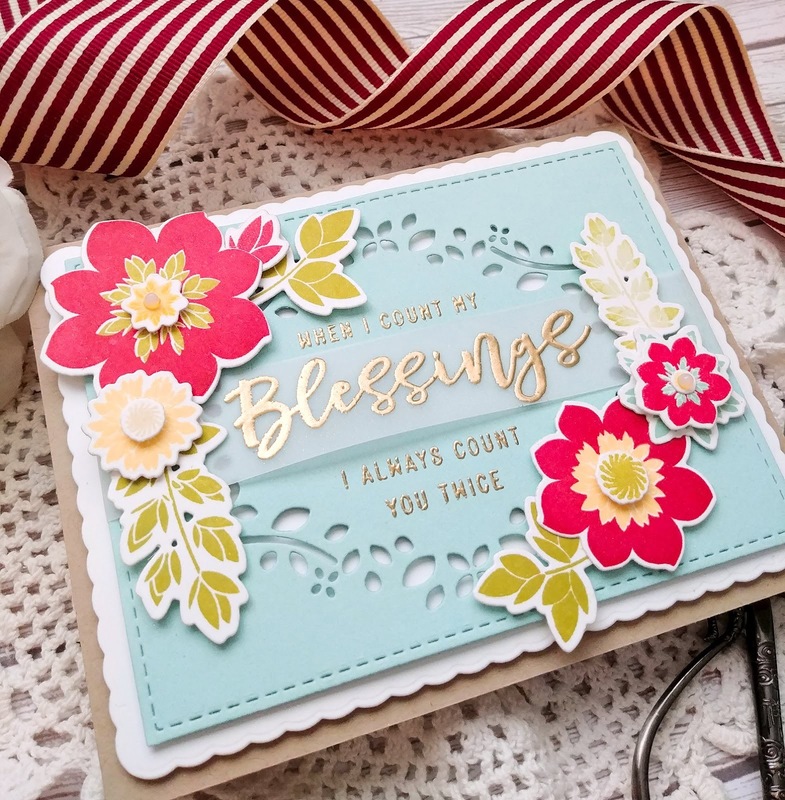 It was so easy to slip this piece into my mini MISTI and line up the sentiments and get those heat embossed as well. The "Blessings" portion is wrapped around and secured in the back using scotch tape. This panel is adhered to a white piece that has been die cut using the Scallop Stackers: Small Die. I just love the extra sweet detail that this adds to the design. I recently purchased the Garden Party stamp set so I thought it would be fun to use for today's bouquets. I die cut all of the pieces I would need using the Garden Party die set and then stamped them using my mini MISTI to make it quick! I had so much fun "transforming" this card! Thanks for fluttering by! I'm over on the SugarPea Designs Blog today sharing this semi CAS card using some of the latest products from the SugarPea Designs release! This is one of those ideas that popped into my head during release week, but I didn't have a chance to execute it until now! I'm glad I have this opportunity to share it with you today! This particular idea came to me when I was making the record player arm/needle using metallic paper for THIS card. 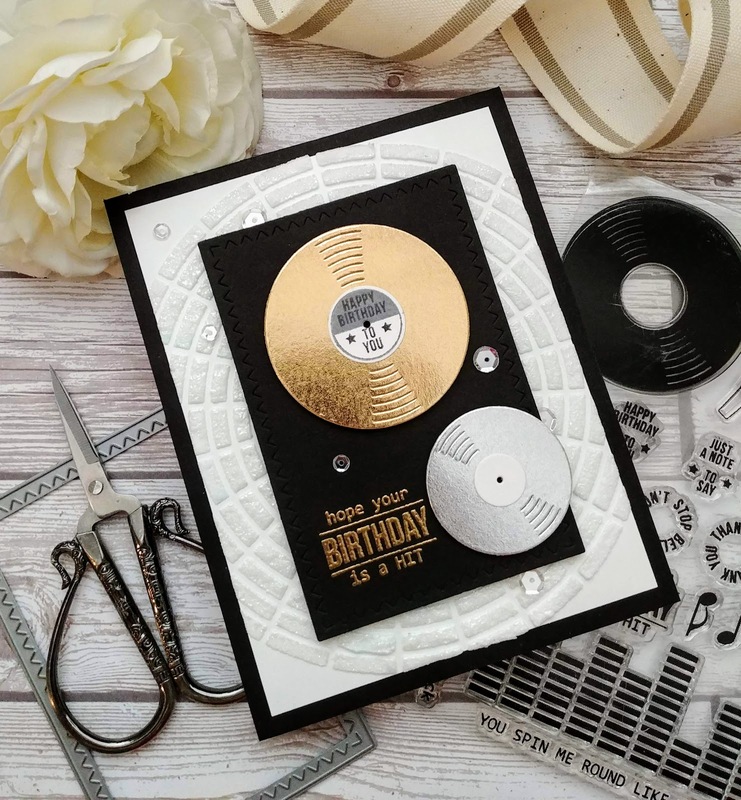 It made me think how awesome it would be to make a platinum and gold record and try to recreate the look of how the recording artists frame their "hit records"! The sentiment pairs perfectly with this idea as well! I also wanted to get a little bit more "technique-y" with the Concentric Circles Stencil and used it to create the background for today's design. To begin my card, I took a piece of white cardstock and centered the stencil over the paper and adhered it to a mat board using washi tape. I cut the piece larger than I needed so I could trim off the edges if need be; and I did end up by needing to! wink! I added a smooth layer of embossing paste and then carefully removed the stencil. Once that was done, I sprinkled embossing powder over the top and heat set it. It does get bubbly, but don't worry, this is completely normal. I set it aside to cool and got to work on the rest of the card elements. 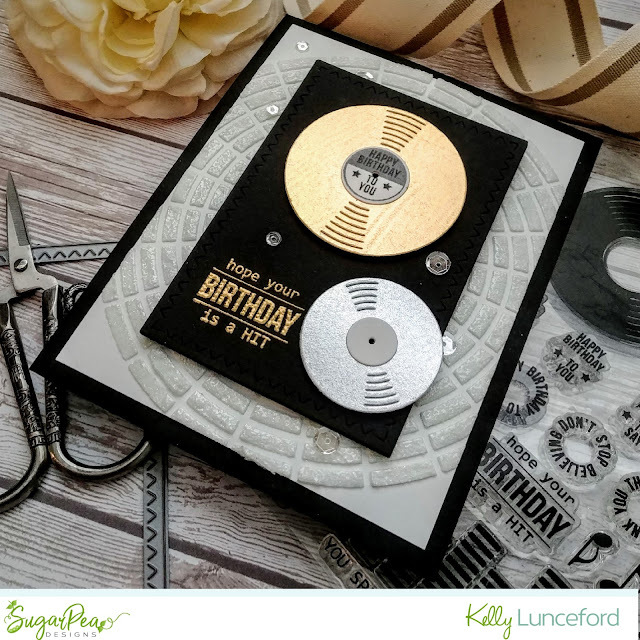 As I mentioned earlier, the records are die cut out of silver and gold metallic specialty paper that I picked up at Hobby Lobby. They are $1.99 a sheet, but you can use a 40 percent off coupon or buy them when they are on sale to make them more affordable. I never use too much on any one design, so they usually last for a while. I used the Greatest Hits SugarCuts for both the records and the tiny little labels. I die cut a piece of black cardstock using the Zig Zag Stitched Rectangles SugarCuts to create the base to add the records. I heat embossed the sentiment, which is from the Greatest Hits stamp set, in the bottom left corner. The record label stamp and sentiment is also from this set. I layered everything onto the black rectangle using foam squares and added a few sequins here and there for some shine. The entire piece is adhered to a black standard A2 top folding card base. This was such a fast and easy design to create, but with some fun touches! Thanks for fluttering by! 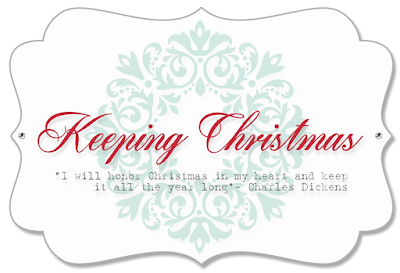 Hello and welcome to February's installment of the Keeping Christmas Blog Hop! This post is a little difficult for me to write as I have had a hard week with the unexpected passing of my amazing and wonderful Mother-In-Law! 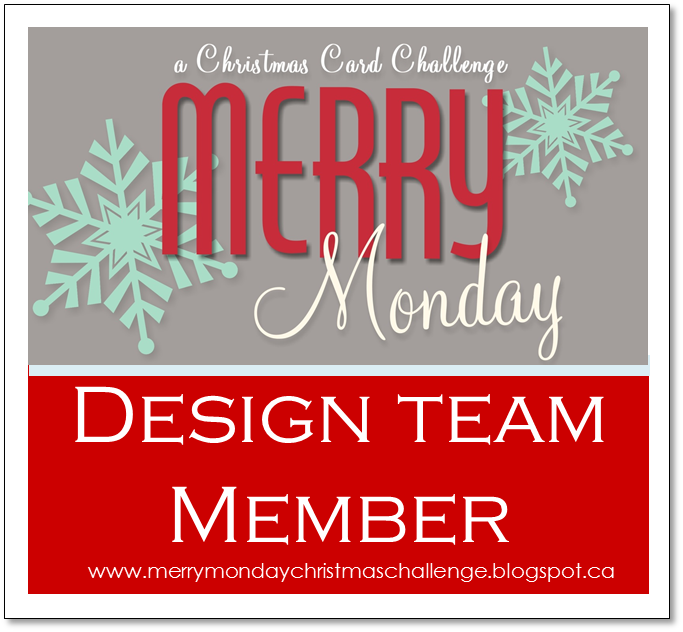 As I created this month's project this last week, I couldn't help but think of how all of our Christmases will now be so different! I hope you will cherish your family and your traditions because you don't know when they will be gone! My mind was so focused on other things, that my creativity was lacking, so the only thing that I could think of, was to make something that I wished I made last year and didn't get around to. I don't want to be a black cloud, so please forgive me if I am sending that message! Christmas is a wonderful and magical time; especially with the birth of our Savior and He gives me the promise that I will see my MIL again! 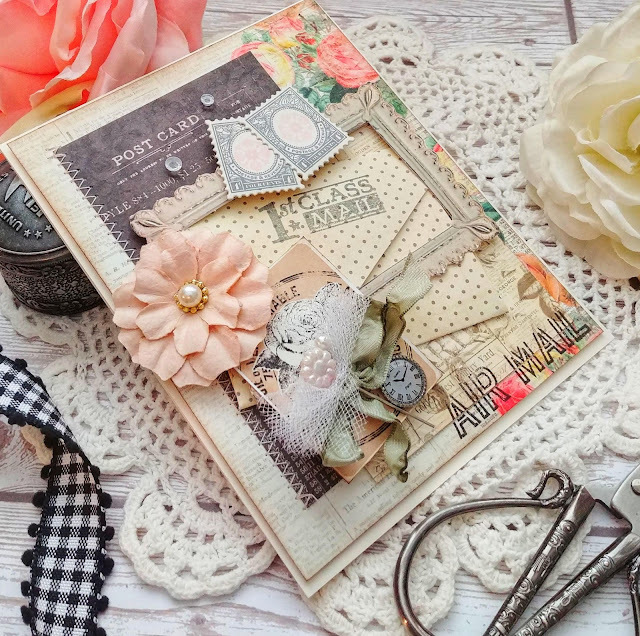 Before I dive into my project, don't forget to hop along to the rest of the designer's blogs to get some fresh inspiration, and maybe some cheer! ha ha! Also, we are saying a sad to goodbye to Rachel Bergfeld who has wowed us with her amazing creations! 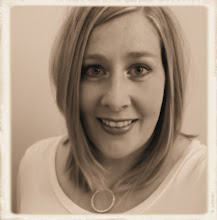 Thank you for all you have done and contributed to our blog hop! 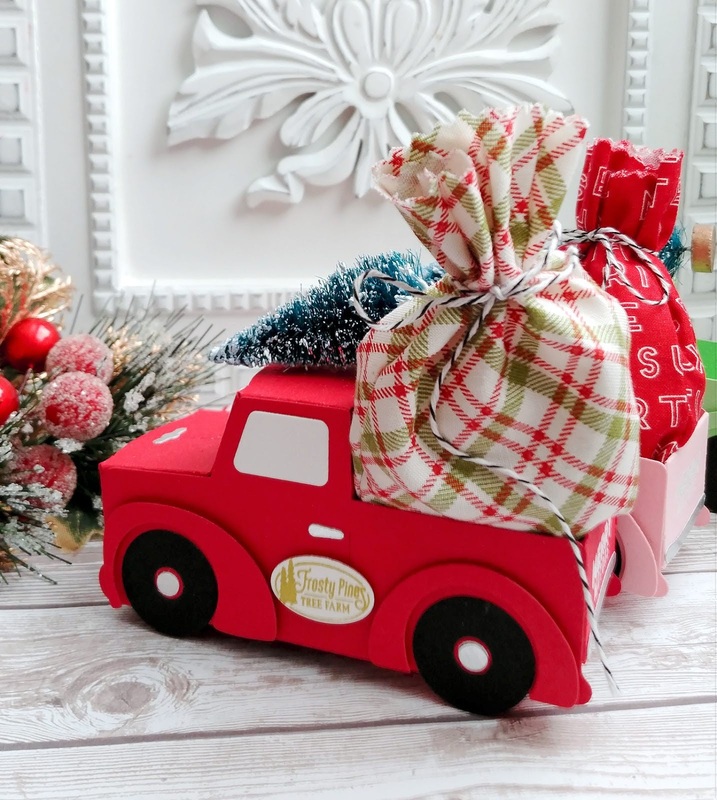 The Dashing Through the Snow series delighted us all this past year and I had so much fun making a bunch of the sleighs that you can see in THIS post. 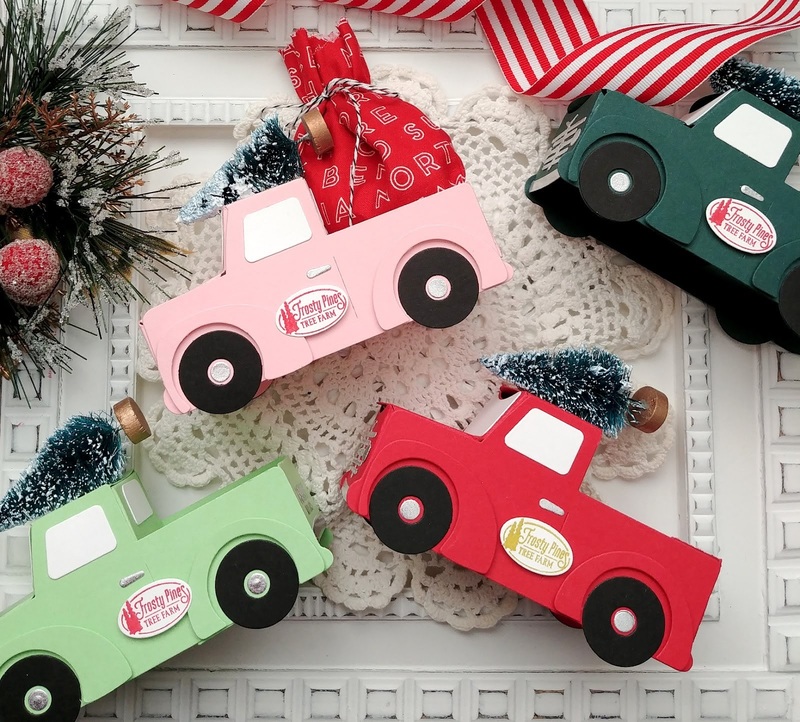 I also was able to make a few Autumn inspired trucks that you can see HERE, but I never actually made any Christmas trucks even though it was on my "want-to-do" list! 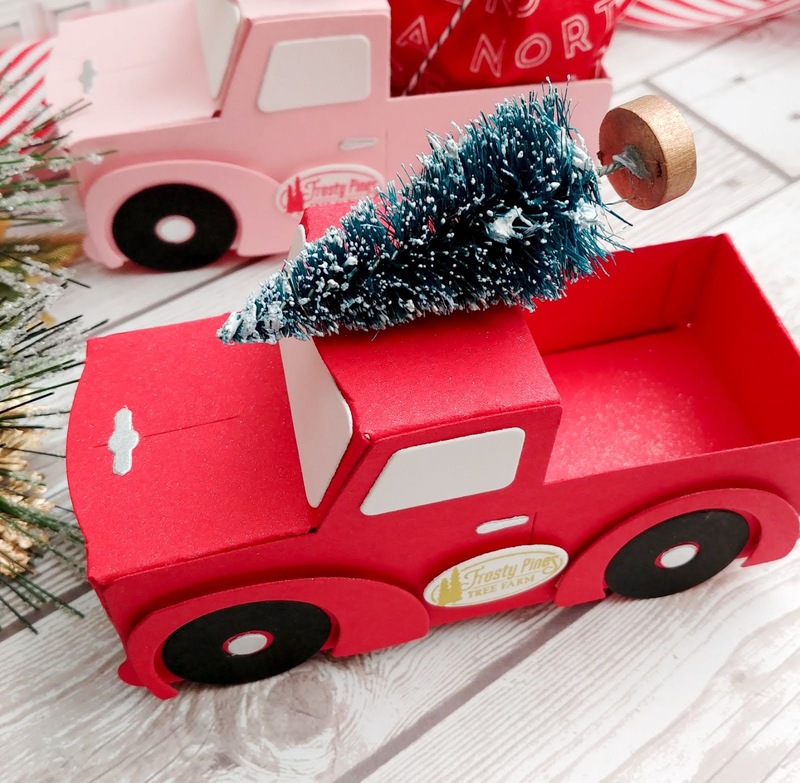 I bought some larger bottle brush trees last year and knew that I wanted to add them to the top of the trucks, like you do when you pick out your fresh tree. My daughter informed me that if I had a truck, the tree wouldn't go on the top, but in the bed! Well, of course, but if you need to fill it up with gifts, then it goes on the top! LOL! I made these sewn Santa sacks for the sleighs last year as well as a few for THIS project. I'm not 100 percent certain what will end up in the back of these trucks, but at least they're made! 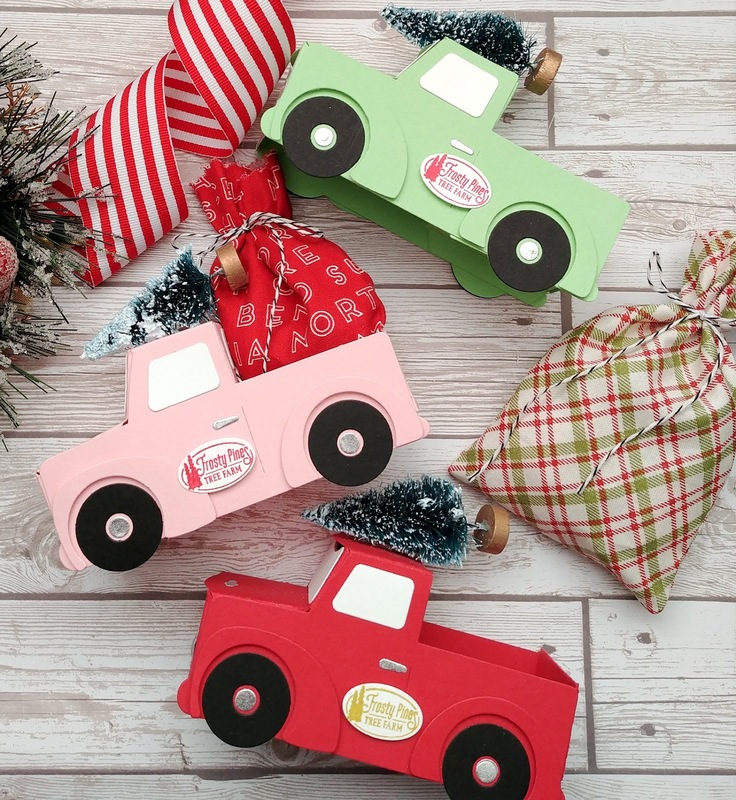 I ended up by making 4 trucks in total; Pure Poppy, Pale Peony, Vintage Jadeite and Pinefeather. I was so tempted to make them the same colors as the sleighs, but decided I wanted to change things up this year! 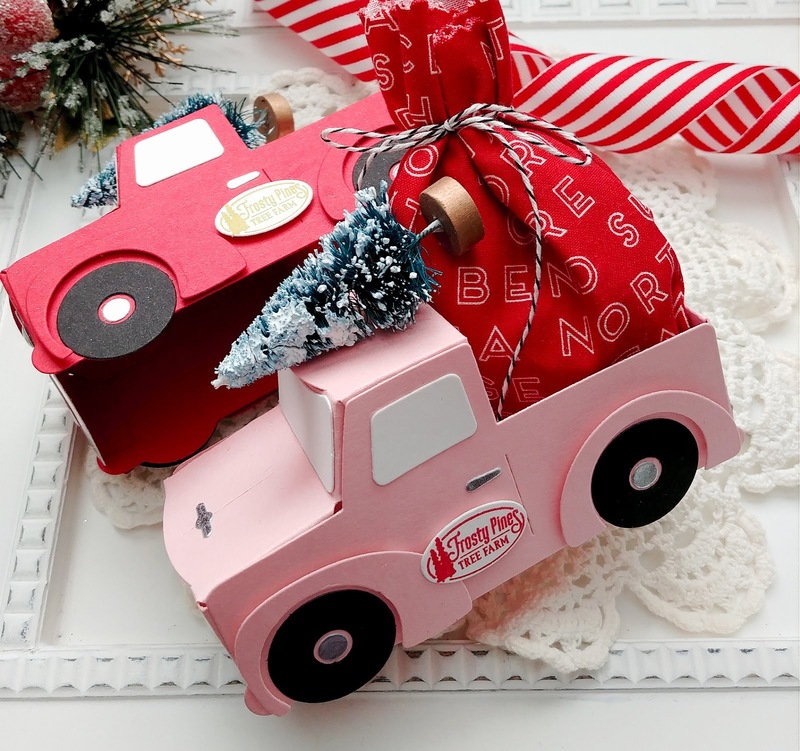 I do have a photo of how I assemble these trucks at the bottom of the post, so make sure to take a look if you are interested. I had promised some assembly instructions clear back last fall and I am just now getting it done! To begin, I used the Dashing Through the Snow: Pickup Die and die cut all of the pieces using the different colors of cardstock. 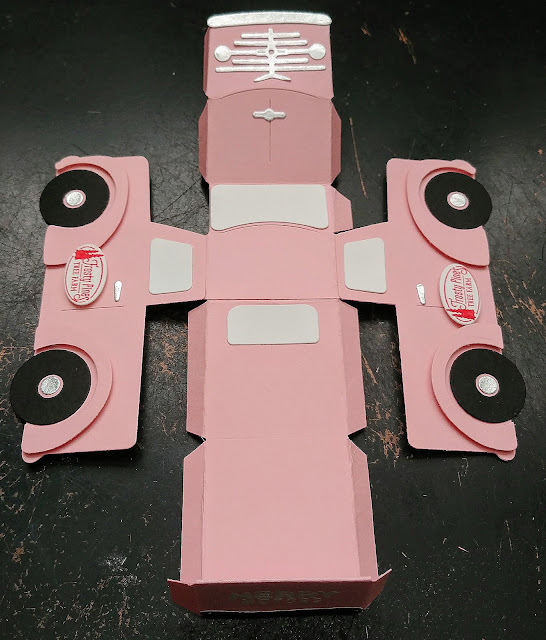 I used metallic paper for all of the hubs, door handles, grill, bumpers, and hood piece. I really like the realism that it adds to the trucks. 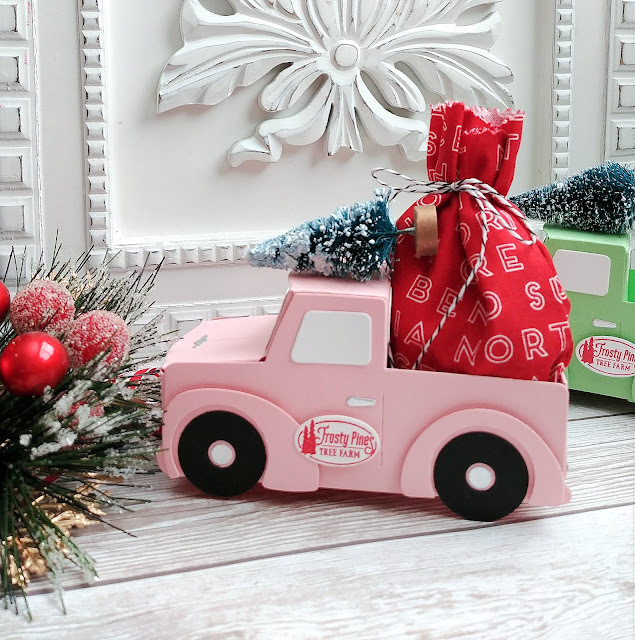 The Frosty Pines sign is stamped using the companion set called Dashing Through the Snow Sentiments. All of these products are on sale right now, which is awesome! I like to give the trucks some dimension on the fenders and the "Frosty Pines Tree Farm" sign. Everything else is flush to the truck. 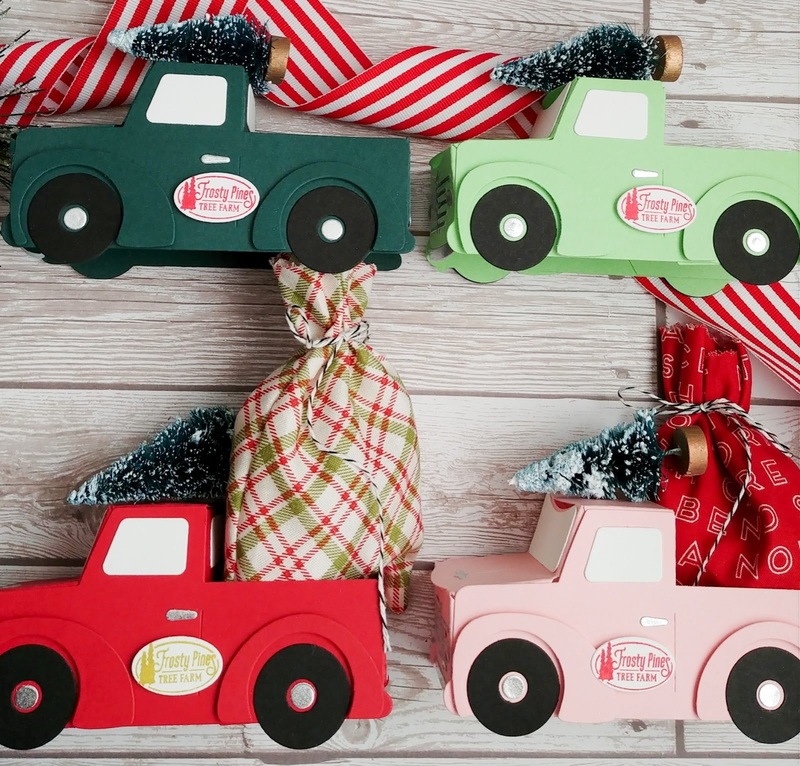 Each truck was spritzed with Shimmer Spray and the tree is hot glued to the top for security. I follow all of Betsy's instructions on the first steps, but I do prefer to completely decorate the pieces when it is flat so that I can get things placed correctly. I just really find it to be easier this way. This photo gives you a good visual of how it looks before I start gluing all of the tabs. Betsy uses liquid glue on her tabs, but I like using ScorTape. I use liquid glue for the other pieces that are shown here, with the exception of the popped up pieces. I hope you have fun on today's hop! Thanks for fluttering by! 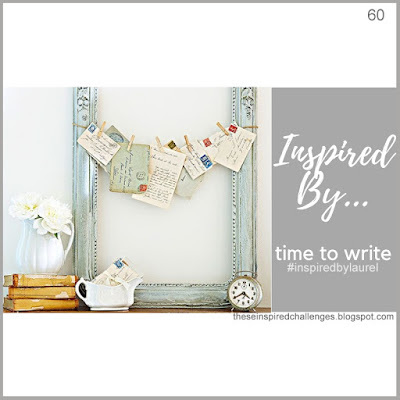 It's time for this week's Inspired By Challenge and it is a fabulous one! I sure hope you get a chance to play along! One of the reasons why I am so excited to be a part of this challenge is because I am able to use a lot of supplies that I don't normally get a chance to use! I love creating vintage designs and I don't make them nearly enough! 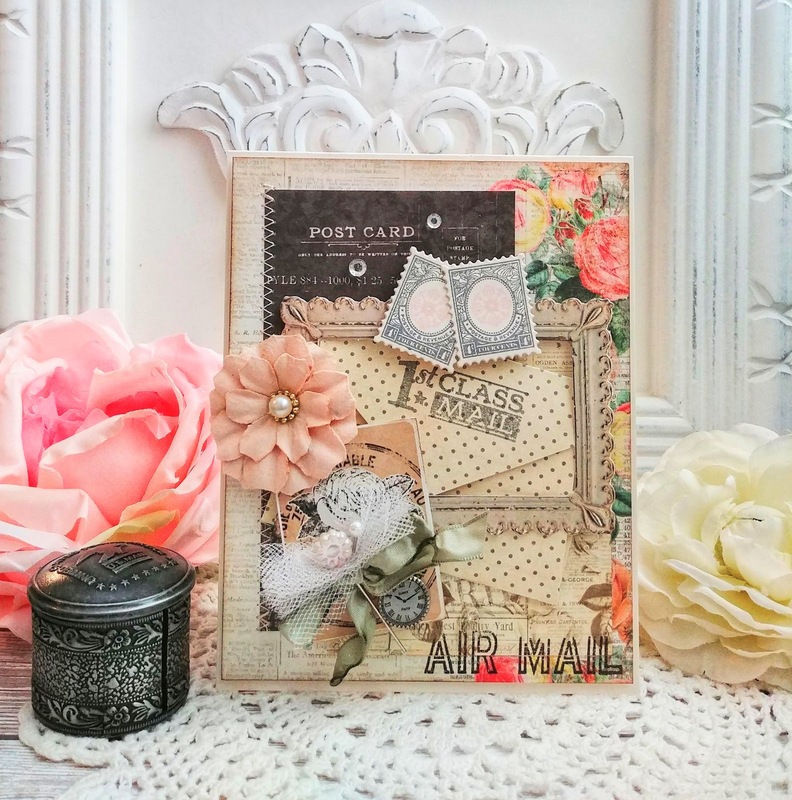 I was inspired by the frame, the little clock, the flowers and of course the vintage postcards. I've had these paper frames for YEARS...I think the copyright on the package said 2007 and I don't think I've used a single one! It was the perfect starting to point to start gathering papers and bits and bobs to add to my card. The paper pad that I used is called "Something Blue" from Prima Marketing and I picked it up a handful of years ago at Hobby Lobby, but I'm pretty sure they still carry it. I layered some of the papers together and added some machine stitching along the edge. I used an envelope template to create the tiny envelope. I stamped the "1st class mail" image, which is from a retired PTI set, on the front flap. I also stamped some postage stamp images that are from the same set and used the Postage Die to die cut them. I added some crinkled ribbon, a tiny clock, some tulle, and a paper flower. I tied the ribbon in a bow and then used my heat tool to get it to crinkle like that. It is one of my favorite things to do on my vintage designs. The tulle is gathered and secured using a decorative pin with the end snipped off using wire clippers. I added a few sparkling clear rhinestones here and there for sparkle. I also spritzed it lightly with shimmer spray. I hope you get a chance to play along. I love seeing what you come up with! Thanks for fluttering by! Hello friends! I hope you're all having a fantastic day! 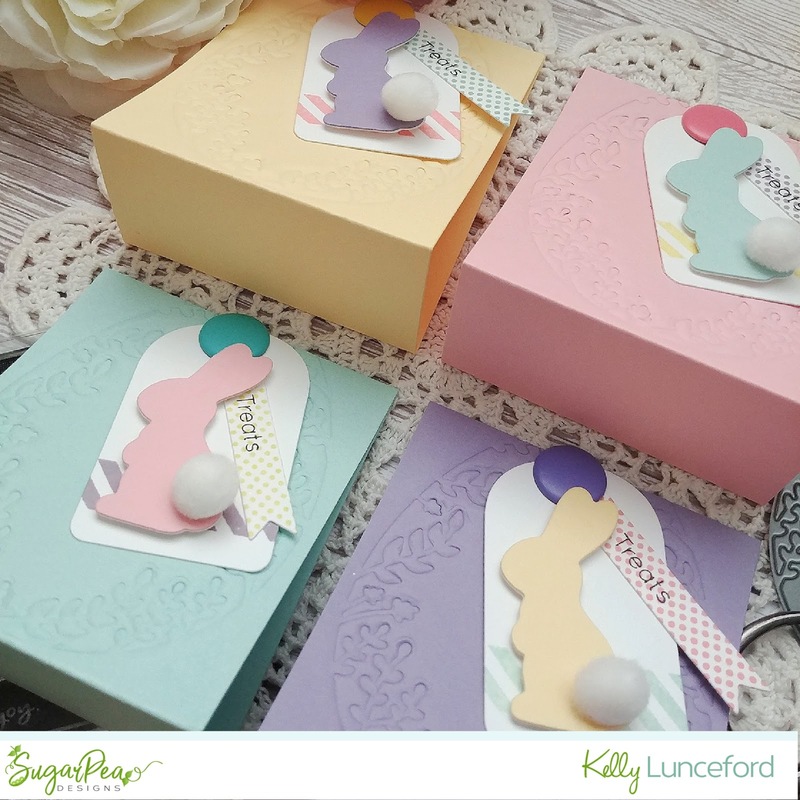 Today a few of us Papertrey Ink gals are sharing some new and creative ways to use the Bunny Blessings stamp set! 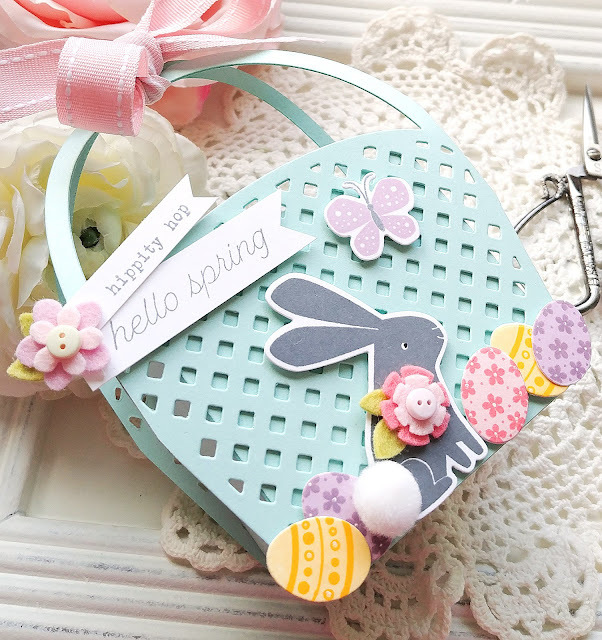 Ashley has put together a video that is sure to put a "Spring" in your step! Ha Ha! 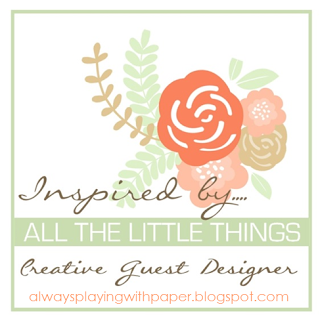 You'll want to head over to the Papertrey Ink Blog to check that out as well as see what the other designers have come up with; I promise you won't be disappointed! 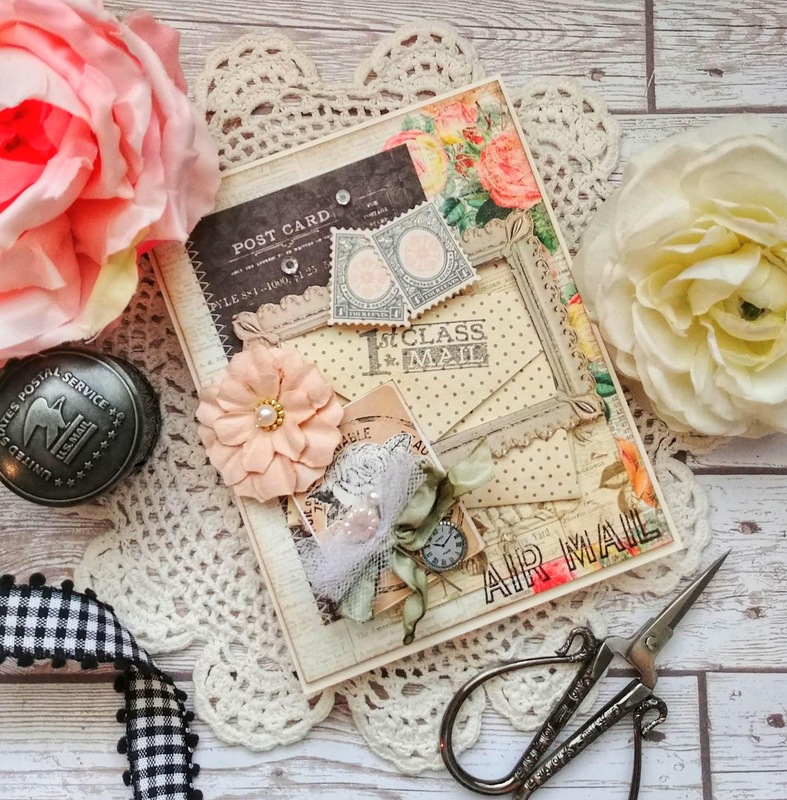 I don't know about you, but I just love stretching my supplies to use them in new and different ways. 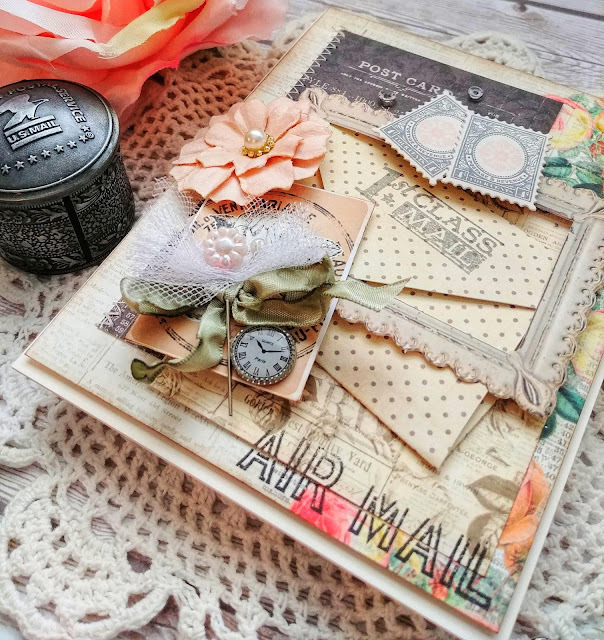 I have a tendency to fall hard for certain stamps and dies and reach for them often, yet I don't want my projects to look the same year after year! Today I have taken, what would normally only be used for a card, and turned it into a 3 dimensional treat basket. I used the same idea on THIS project and I love how it turned out. I gave those away on Valentine's Day to my 5 year old's preschool teachers. I hope they like them! Anyway, I guess what I am trying to say is that you can turn pretty much any large die into a 3D project! To begin, I die cut 4 of the Coverplate: Basket Die out of Aqua Mist cardstock. I used my guillotine style trimmer to chop off the extra border pieces. I used 2 for each side and glued them together using liquid glue. Once that was done, I got to work on the box portion for the middle. The two basket pieces work as a sandwich for the box. This particular box is constructed in the same way as the box in THIS post, but with different measurements. The sides and bottom are 2 inches and the front and back measure 3 inches. Make sure you leave a little tab to secure it together. It is about 2 inches tall. I used 1/8 inch ScorTape to run little pieces along the backside of the basket dies here and there so that it would secure nicely to the box. Make sure you don't put any adhesive on the portions that won't be hidden by the box. You can see in this photo the way the basket curves out from the box, you want to make sure you don't put adhesive there. Hopefully that makes sense! Once the basket portion was complete, I tied it up with some Sweet Blush 5/8 inch Saddle Stitch Ribbon. This is completely optional and it looks just fine without it, but I love adding ribbon to my projects if I can, since I don't put much on cards anymore! 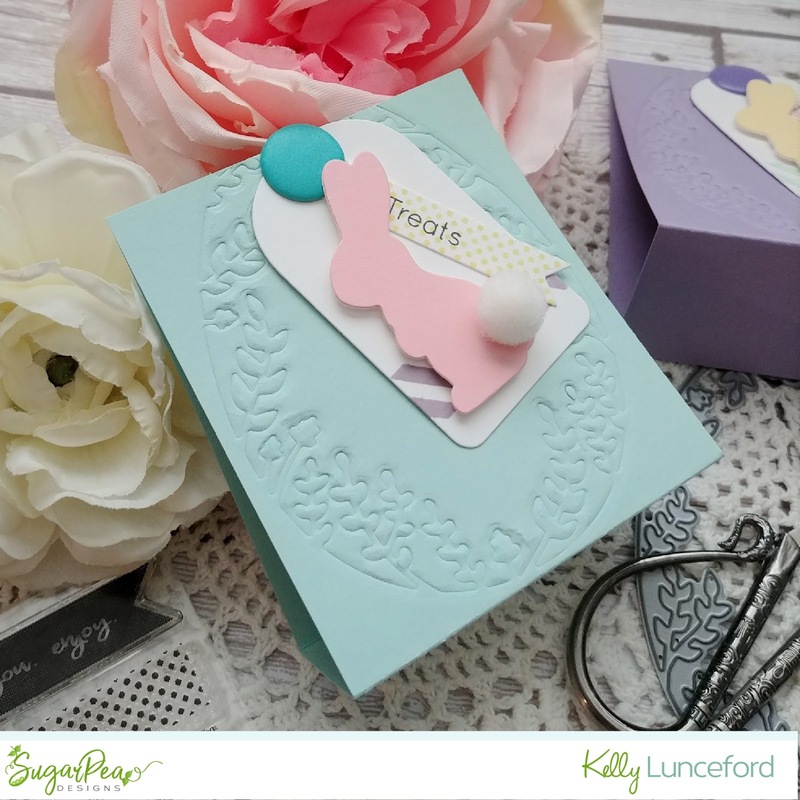 The bunny is stamped in Weathervane ink and then die cut using the coordinating Bunny Blessings Die. I did add a small black dot to the bunny's eye using a fine point black marker. I added a white pom pom to the tail using hot glue. I stamped the eggs using my mini MISTI so that I could make a lot at one time. They are added to the bottom of the basket using some foam squares. 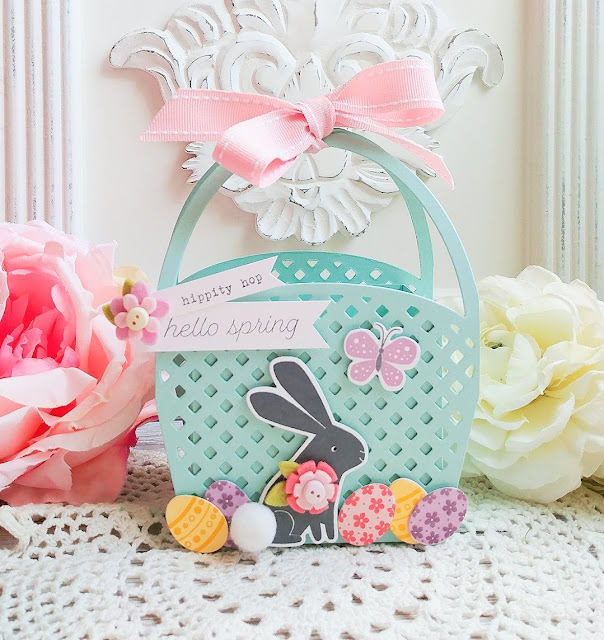 The sentiments are added to the top of the basket with some felt flowers that I created using the flowers in the Bunny Blessings die set. I used hot glue to adhere them together and added some small buttons I've had in my stash for years. I did tuck some Easter grass into the basket, but it ended up looking a little distracting in the photo, so I left it out for aesthetics. In real life, it looks great! 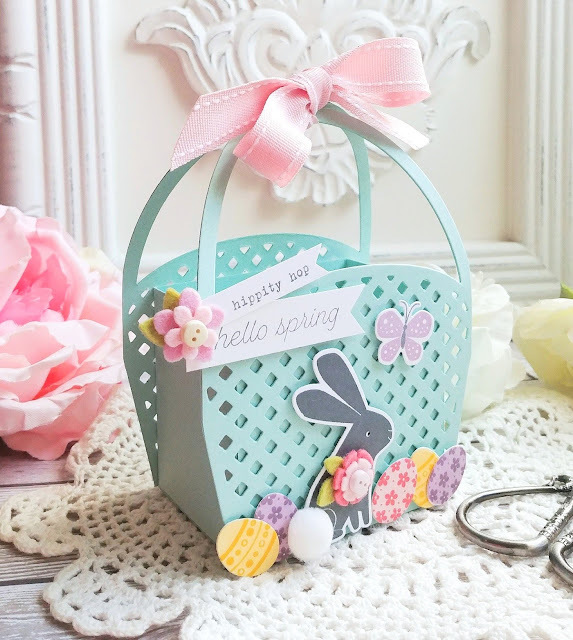 These are the perfect size to add some treats, lip gloss, earrings, or any fun Easter treat! 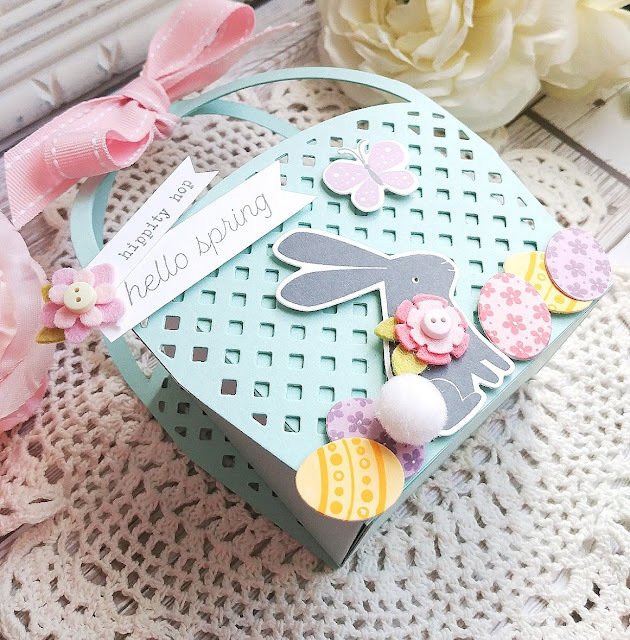 I cleared out all of my Valentine's Day projects and delivered EVERYTHING, so now I am ready to start the process again with Easter! LOL! I hope you've enjoyed today's post! If you have any questions, shoot me and email or leave a comment below and I will answer as quickly as I can! Thanks for fluttering by! 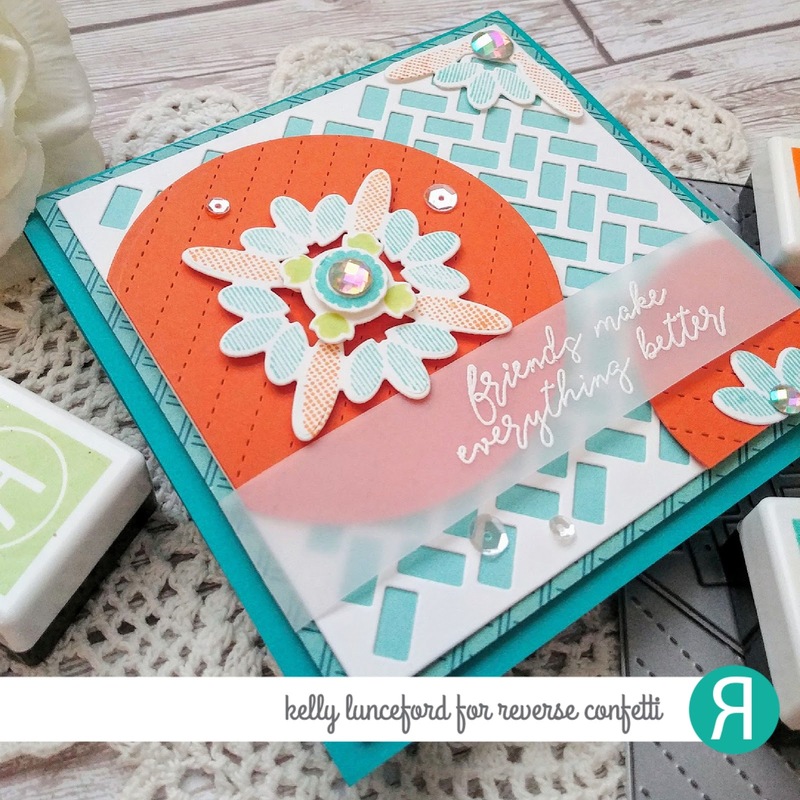 Have you had a chance to play along with this month's Reverse Confetti Stock Your Stash challenge? If not, you'll definitely want to join us this month, especially for a chance to win! 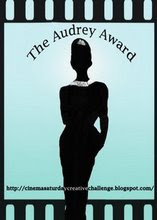 This month's theme is Encouragement and Congratulations! I decided to make an encouragement card to add to my stash! 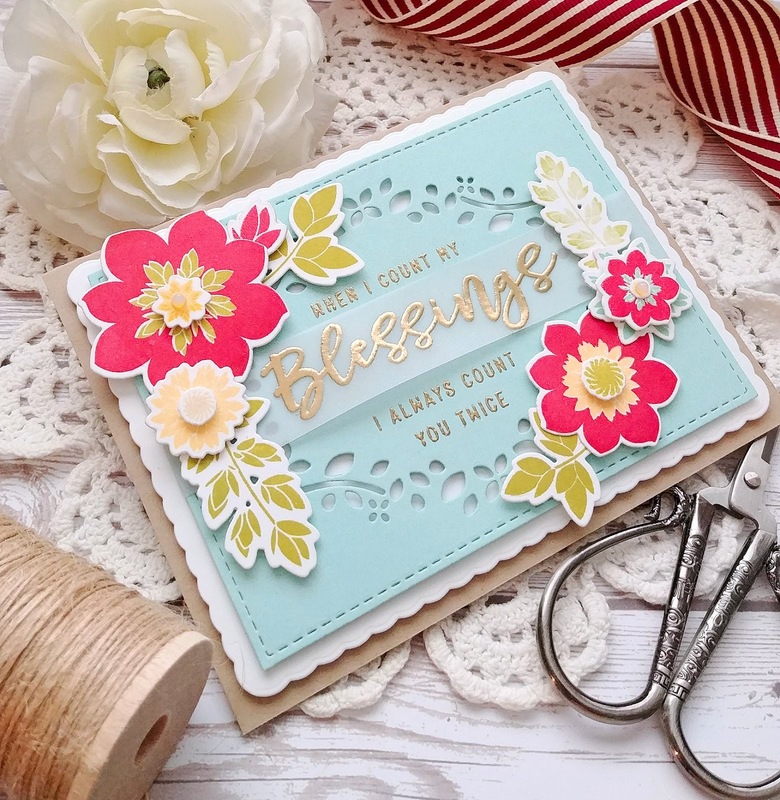 This particular sentiment, which is from the Mod Floral Stack stamp set, is so versatile in who this card be used for. 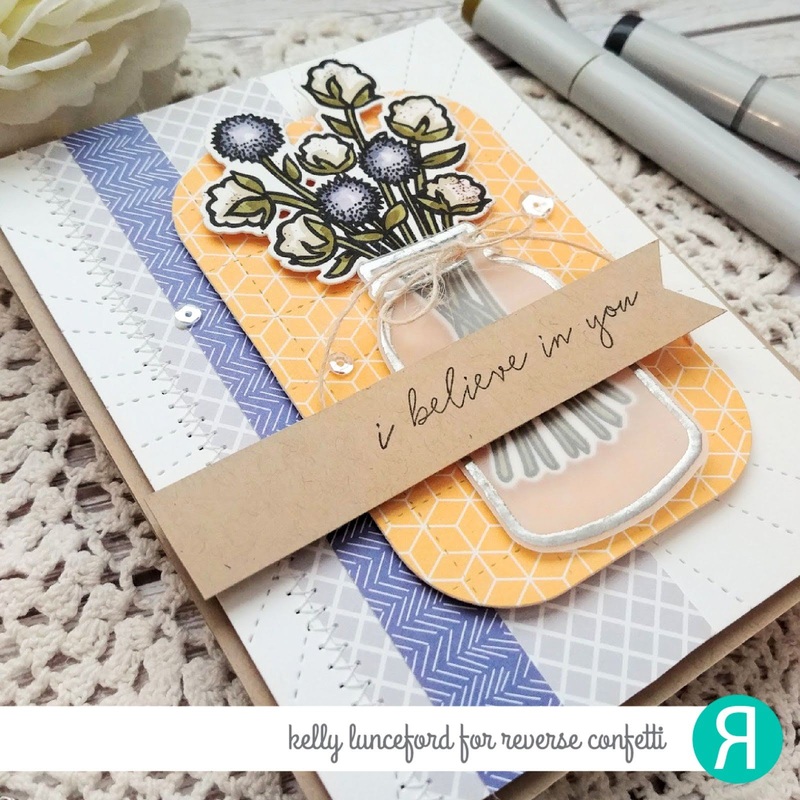 I knew I wanted to use the Cotton and Thistles stamp set and there is a fabulous sentiment in that set that says "know that I care" which I almost used, but in the end felt like the sentiment I used was more encompassing, if that makes sense! LOL! Anyway, to begin, I stamped the jar image using Versamark ink and heat embossed it using silver powder. Once it cooled, I die cut it using the coordinating Cotton and Thistles Confetti Cuts and set it aside. I stamped the floral bundle in black and colored it using Copic markers. I added some brown marker splatters using my Color Spritzing tool to the cotton pieces to give it some realism. I also added some Wink of Stella to the blooms for some shine. Vellum can pose some trick issues when it comes time for assembly, but the sentiment placement was a saving grace! LOL! I added some liquid glue to the embossed portion of the jar neck and secured it over the bouquet. That still left the jar flapping in the wind a little bit, so the sentiment really made it possible to add some extra adhesive! I also tied some jute twine around the bottle neck for some extra detail. I think this soft yellow and purple/grey color combination are really soothing and perfect for an encouragement card. I used the Grid Stitched Tag Confetti Cut on a piece of yellow pattern paper from the Pattern Play 6 by 6 paper pad. I die cut it again using some white cardstock so that I could double stack it for sturdiness. The purple and grey papers are from the Fun Times 6 by 6 paper pad and are adhered to a panel of white cardstock that has been die cut using the Stitched Rays Coverpanel. I did some zig zag machine stitching along the side for some added detail. 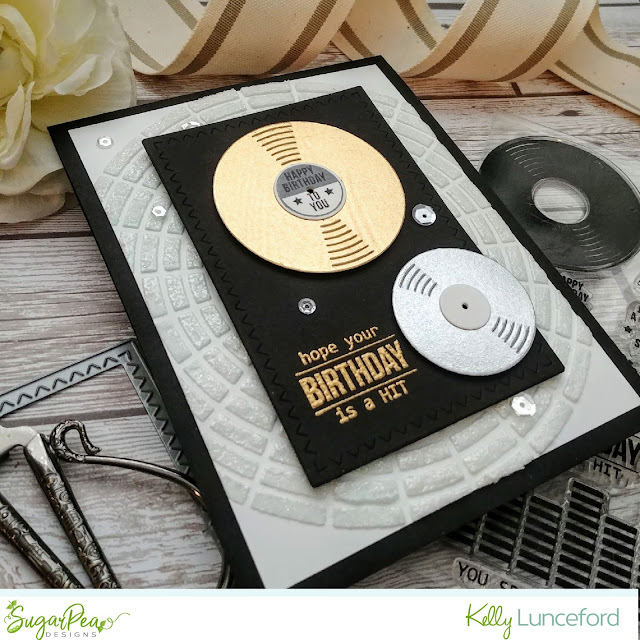 The sentiment is stamped in black and added to the card using foam squares. 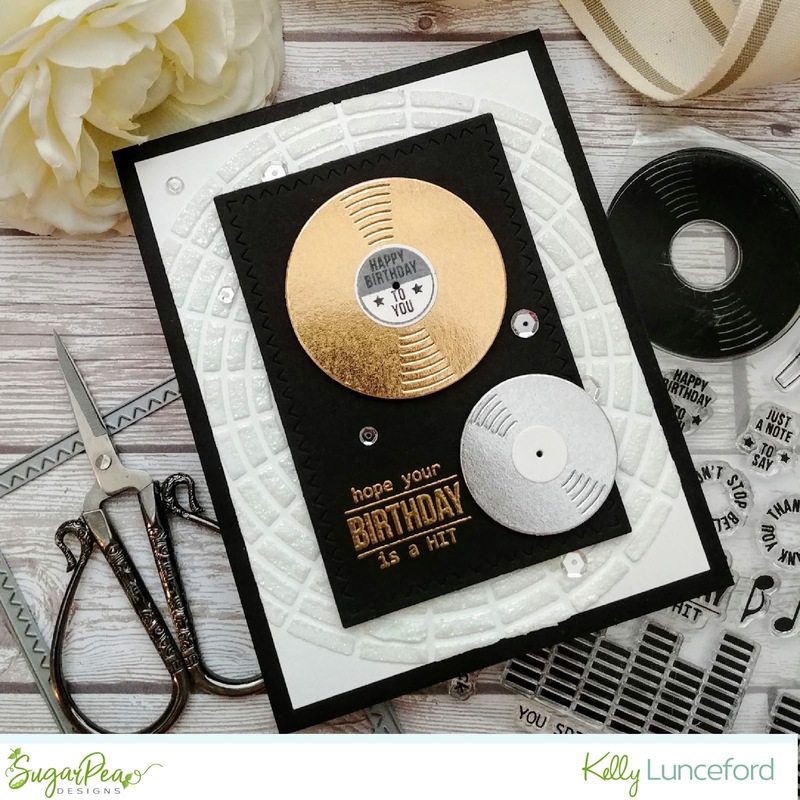 The entire focal piece is layered onto an A2 top folding card base using foam squares as well. I added a trio of sparkling clear sequins for some added shine. Thanks for fluttering by and I hope to see your card in the gallery! 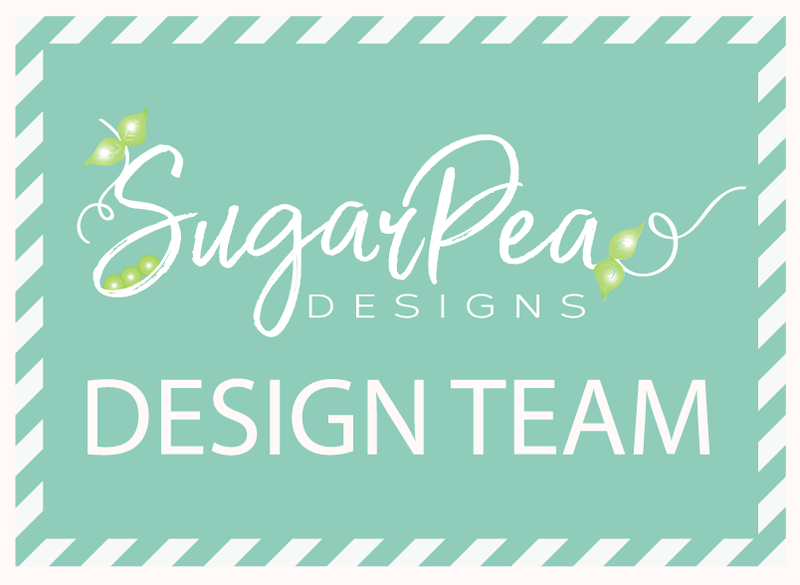 Well friends, today is the 5th and final day of the SugarPea Designs Sneak Peek Week! I've had so much fun and I hope you have too! All of the new products will go on sale tonight, so hopefully you have your wish lists ready! 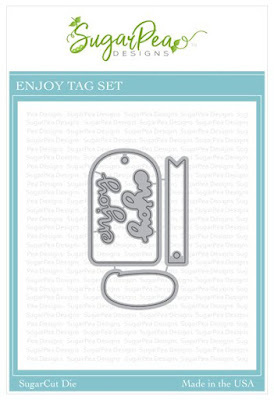 Today the team is sharing sneak peeks of a new set called "Keep Forever Tags" and a coordinating set of SugarCuts called Enjoy Tag Set. Before I dive into the details of my project, don't forget to stop by the other designer's blogs to see how they have used these new sets. 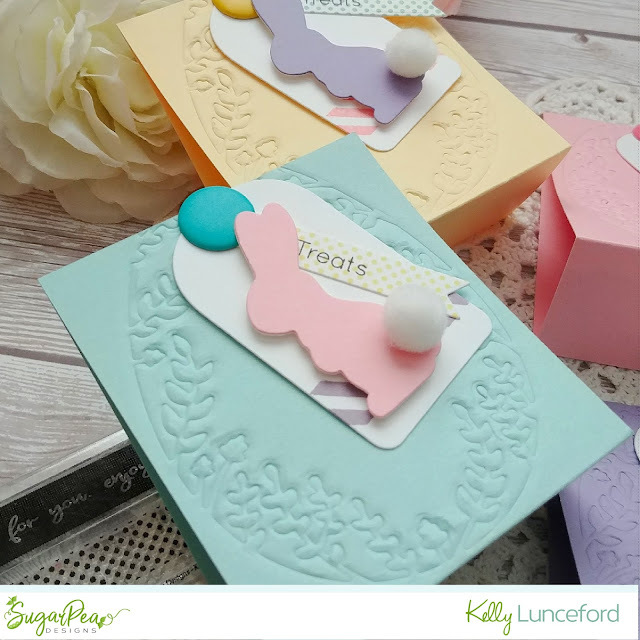 For my project today, I made 4 Easter treat packages using the new stamp set, SugarCuts as well as the Bunnies from yesterday and the "treat" sentiment. These were so much fun to make and so easy! 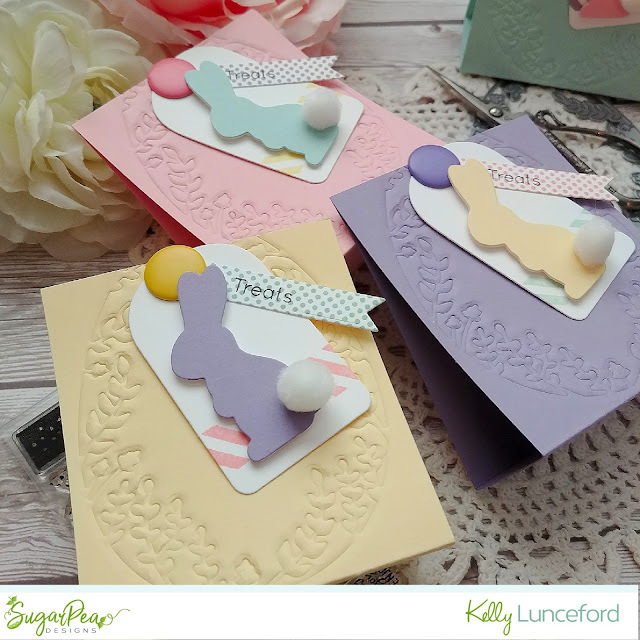 I cut 4 pieces of pastel cardstock and did some simple scoring to create the packages. I will fill up some small cellophane bags with Cadbury eggs and put them inside. They should be hitting stores today since Valentine's Day is over! LOL! Once the scoring was done, I used the Egg Window SugarCut to do some dry embossing on the front. I just used an embossing mat instead of the cutting sandwich. I love the look it gave the front of the packages. It would be pretty to cut it out completely if you had a larger package so you could see the pretty candies showing through. I'll probably have to give that a try before Easter rolls around. I die cut the tag and stamped one of the images from the new set across the bottom to create the striped image. I also die cut four bunnies in the same colors as the packages and hot glued a white tail. This photo shows how deep the bottom is. These will hold quite a bit of candy or treats! All of the elements that I die cut or stamped were done in each of the 4 colors so that I could mix and match everything. I secured everything at the top with a jumbo brad. 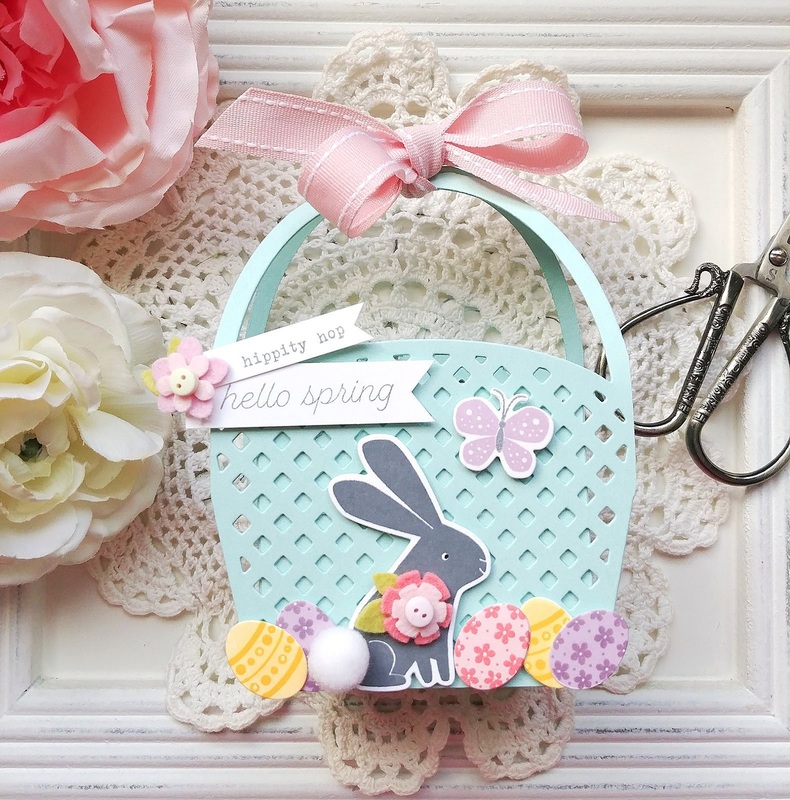 Now that all of my Valentine's Day projects and cards are out the door, I can start my collection of Easter projects! ha ha! Thanks for fluttering by!